I think I’d like Bullock’s more if it didn’t serve barbecue. It’s not that Bullock’s barbecue is bad, but it seems like an afterthought on a huge menu that does a good job serving southern food from fried chicken to fish to ham, with all the sides you could ever want. Bullock’s is a pretty good southern style restaurant that also serves so-so, Eastern-style electric-cooked barbecue (they long ago abandoned cooking over wood). The barbecue is pretty non-descript, standard fare for wood-free, Eastern-style ‘cue, though it is available either chopped or sliced, which adds some variety. Frankly, I’m not sure what else to say about the barbecue, especially after seeing how Bullock’s attorneys have reacted to comments H. Kent Craig made about rumors regarding the source of Bullock’s barbecue. Bullock’s is a family-run business that draws a mixed crowd of Durham natives, Duke students who have likely never tasted barbecue anywhere else except for possibly the Original Q-Shack, and the occasional celebrity. (The vintage 1980’s picture of Bono and U2 with the classic, underwhelmed caption “Band from Ireland” is far and away my personal favorite.). There is actually much to like about Bullock’s, especially the “family style” dinners where everyone in your dining party agrees to eat what amounts to a buffet brought to your table—bottomless bowls of barbecue, chicken, vegetables, etc. And the endless supply of sweet, soft hush puppies that accompanies every meal is hard to resist, even if it is a wee bit unnecessary. Bullock’s has probably helped spread the gospel of barbecue to tens of thousands of folks over the years, especially given the number of out of town visitors who find their way to Bullock’s through Duke or other connections. Hopefully many of those folks have gone on to try some ‘cue from other joints that do more justice to the ‘cue NC has to offer. Still, if you can manage your expectations, you shouldn’t be disappointed by the overall dining experience at Bullock’s. 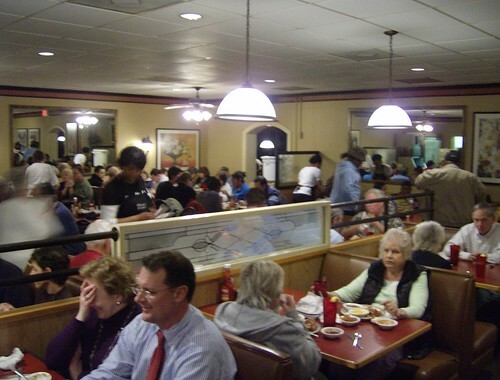 I’ve always enjoyed my trips there because of the friendly atmosphere, the large and diverse crowd of diners, and the fact that Bullock’s really is a Durham institution. As long as you don’t go to Bullock’s looking for a great plate of barbecue you’ll enjoy yourself. For an interesting post on the history of Bullock’s Bar B Cue, see our pal at Endangered Durham’s post here.